The leading distributor of wholesale palms in Florida, A Quality Plant - Florida Wholesale Palms is the home of the most eye-catching tropical themed palm tree gardens. Given our extensive experience in the field, we have made significant strides in the industry. As the best Florida wholesale palms distributor, we pride ourselves of being the best source of information to our partners. Most importantly, we are committed to integrity, honesty and best practices. Through our fully automated systems, we continue to prepare for the future. Why choose A Quality Plant for Your Wholesale Palms? Exceptional Customer Service in Palm Tree Sales. We offer unmatched customer service to bring your vision to life. We work hard to discharge our duties to fit your unique needs. Furthermore, when you place an order, we offer quick turnaround times. In addition, we analyze important factors like rainfall, temperature, and shade when recommending a palm tree. Our goal is to save our customers time and money by eliminating the middleman cost. Our palm tree species are reasonably priced. For example, the Sago palm costs as low as $35 while the Medjool date palm costs $3800. Our rates are the best compared to those of our competitors. Over the years, we have enhanced our distribution over Florida. We offer palm trees that are grown in containers as opposed to those approaching their maturity stage. We sell almost any palm tree you can ever think about. The main species include Canary date palms, Sylvester palms, Bismark, Sabal, Areca palms among others. We also offer field growing palms like Ribbon palms, Washington palms, Pygmy date palms, Paurotis palms etc. At full grown maturity, most of these species can reach a maximum height of up to 50 feet. Our professionals guide the clients in selecting their preferred type. In a bid to satisfy our customers, residents of Florida are able to select palm trees from our rich stalks. As the leading Florida wholesale palms distributor, we are mandated to assist our clients make the right choice of species. Our enthusiastic nature to make Florida a top tropical city has made us source for the best palm trees. We are devoted at maintaining the highest standards in each and every stage of our growing process. At A Quality Plant, we strive to go beyond the typical service. We also offer landscaping services throughout Florida and the surrounding areas. If you are looking for a reliable wholesale palms distributor, contact our customer service team for more information. 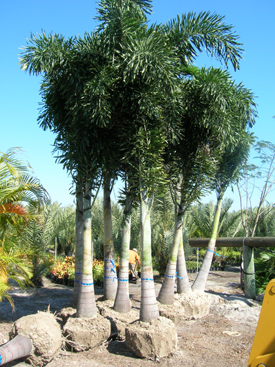 We appreciate your interest in A Quality Plant - Florida Wholesale Palms. When we talk of wholesale we mean it.